My beautiful friend Fatin (also well known as “mad” or “mad4rombks”) has been an integral part of the romance community for years – she owns and runs the RR@H Novel Thoughts and Book Talk blog, is an administrator of the WriteMinded loop my author loop and facebook page as well as my assistant and friend. She’s also a tireless advocate for romance novels and a friend to so many in this community. On Tuesday, March 8th, she lost her husband in a senseless act of violence, leaving her alone with four children. You can read more about the tragedy here. When I heard about this horrible tragedy, I wanted to do something special to help out. 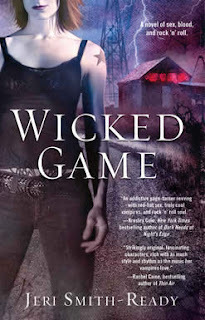 So I've donated a "marked-up" (director's commentary, annotated, whatever) version of Wicked Game. You can learn all sorts of inside information, like which of my real-life first-grade classmates the bully Jolene was based on, how I chose the different playlist songs, how certain scenes played out differently in earlier drafts (hint: one involves David and a LOT of drinks), and which details of Sherwood and vampires are true to "real-life." I've only done this once before, so this is a two-of-a-kind prize. It takes a lot of work--fun work--to come up with amusing anecdotes and tidbits, which is why I don't often offer a prize like this. As of now, the bidding is only up to about $15--which is the same amount you would pay for this trade paperback if you bought it in the store! (EDITED TEN MINUTES LATER TO ADD: Wow, it's up to $50 now--y'all rock!) Please consider bidding so that you can have this unique version of the book and to help out Fatin in her time of need. Fellow romance author, Kerri Nelson, here. Just wanted you to know that I came out to the auction to bid on your item specifically. I wanted to show my support for this terrible tragedy. But also, I wanted to show my support for you. I believe you are one of the most under-appreciated talents in the writing market today. I'm a huge fan and this special edition of your book will be something that I will treasure for years to come. Thank you so much, Kerri! That means a lot to me.